Mr Norris of Messrs Norris and Hewitt appealed on behalf of one of his twist-hands named Thomas Calvert, on the grounds that he was making goods for the export trade. The thirty two year old also appealed on his own behalf; having lost his younger brother John who died in Mesoptamia, he was now the sole support of his sixty-two year old widowed mother whose husband had died some nine years previous. Both appeals were unsuccessful however and Thomas Calvert was conscripted into the army. Thomas joined the local Sherwood's regiment and it was not long before he was in France with his new colleagues. The following is a description taken from a History of the 10th Battalion Sherwood Foresters 1914-1918 by Cliff Housley. During the night of the 15/16th April 1918, the 10th Battalion Sherwood Foresters relieved the 4th Bedfordshire Regiment. The actual front included about 600yards of Aveluy Wood and 200yards of railway. The enemy artillery was very active on the night of the 16th, and thereafter concentrated on the high ground to the east of Mesnil. The men were soon engaged in deepening and strengthening the position and, at the same time, they also completed the digging of the support line. The enemy artillery was stepping up its activity by both day and night and the battalion began to suffer heavy casualties. Private Thomas Calvert was one of the men missing presumed killed during this enemy action. He is commemorated on the memorial to the "Missing" in Poziers British Cemetery. The Poziers Memorial - the memorial relates to the period of crisis in March and April 1918 when the Allied Fifth Army was driven back by overwhelming numbers across the former Somme battlefields, and the months that followed before the Advance to Victory, which began on 8 August 1918. The Memorial commemorates over 14,000 casualties of the United Kingdom and 300 of the South African Forces who have no known grave and who died on the Somme from 21 March to 7 August 1918. The Corps and Regiments most largely represented are The Rifle Brigade with over 600 names, The Durham Light Infantry with approximately 600 names, the Machine Gun Corps with over 500, The Manchester Regiment with approximately 500 and The Royal Horse and Royal Field Artillery with over 400 names. The memorial encloses Poziers British Cemetery Plot II of which contains original burials of 1916, 1917 and 1918, carried out by fighting units and field ambulances. 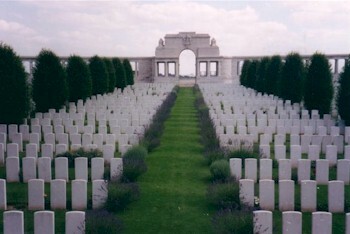 The remaining plots were made after the Armistice when graves were brought in from the battlefields immediately surrounding the cemetery, the majority of them of soldiers who died in the Autumn of 1916 during the latter stages of the Battle of the Somme, but a few represent the fighting in August 1918. There are now 2,755 Commonwealth servicemen of the First World War buried or commemorated in this cemetery. 1,375 of the burials are unidentified but there are special memorials to 23 casualties known or believed to be buried among them4. 2Beeston, 1901 Census, Piece 3153 Folio 39 - lists all eight children and their ages : Fanny (26), Robert (23), Arthur (20), Betsy (18), Thomas (17), Sophia (14), John (12) and Sarah A (10). 3Conscription had been introduced in January 1916 for all single men aged betwwen 18-41. This was extended to married men in May 1916. Those who claimed to be exempt by reason of ill-health, occupation or conscientious objection could appeal to a Military Tribunal.